It has been a while since we last post here and the Internet landscape continues to change. Most importantly, a new generation of broadband Internet is now available for the States! We have always heard how crazy fast Internets is in Japan and other South East Asia countries. They can get like 100Mbps for as cheap as 50USD. The price-performance ratio is like 10 times better than the Comcast we have. But things are changing and we no longer have to be jealous. The new generation of broadband has arrived. 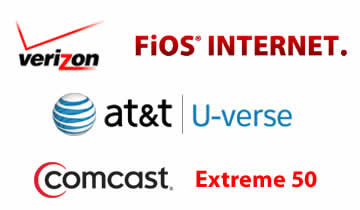 With the introduction of Comcast Extreme 50 (DOCSIS 3.0), AT&T U-Verse and Verizon FiOS, Internet is faster than ever. These new generation of Internet services are quite expensive though, up to 140USD per month. It’s no good for home use. As business owners, you also have to think throughfully before getting one of these services, since there are other costs associated with this upgrade. After you get one of these new broadband, you will still need a dual-wan router or multi-wan router. Why? This is because just like every new technology out there, they tend to fail more. Moreover, the Linksys or D-link you have may not be working for you anymore due to the new higher throughput requirement. You end up creating a bottleneck yourself using a cheap router for these services. You may as well update to the new Multi-WAN router with high throughput, such as the Peplink Balance 390. Another hidden cost is that you will have to upgrade your Wireless LAN too. The 802.11b/g Wi-Fi infrastructure has a theoretical limit of 54Mbps, which in real life, it never reaches that fast. You will therefore need to upgrade to 802.11n Wi-Fi too. Now that one massive network upgrade for a faster internet. Contents Copyright © 2009 Dual-WAN.com and Contributors. All Rights Reserved. All trademarks and copyrights on this site are owned by their respective owners.